Preheat the oven to 190C/375F/Gas 5. Grease a 24cm/9 1/2" round tin, preferably loose bottomed. Make pastry by sieving the flour and icing sugar into a bowl, mix in the ground almonds. Rub in the margarine and bind together with the egg and a little cold water to make the pastry. Lightly knead, cover and allow to chill. Next make the filling by creaming the margarine and sugar together. Beat in the egg. Stir in the flour, ground almonds, milk and essence. Roll out the pastry and line the tin. Spread filling evenly over the pastry. 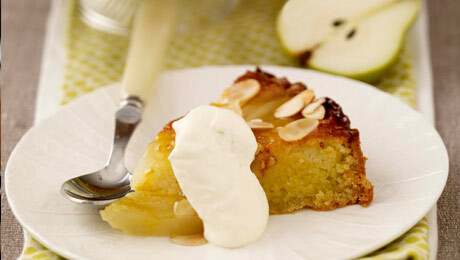 Arrange the pear halves, with the rounded side facing up, on top of the filling. Bake for about 35 minutes until risen and golden brown. Leave in the tin to 'set' for 10 minutes, then remove and serve warm with cream or ice cream. This was delicous and very straightforward! I substituted the margarine with butter, used 0.5 tsp almond extract ( no quantity given on original recipe); glazed the baked tart with warmed apricot jam, sprinkled on toasted flaked almonds and finished with a it dusting of icing sugar!